RHYS: At the time of writing this I am in the Perigord Noir region of France, famous for its gourmet delights: truffles, pate de foi gras, escargots, duck cooked a zillion ways. I confess that one of our reasons for coming here was to sample the cuisine. Lots of restaurants with Michelin stars, famous markets full of local produce. I have to thank Martin Walker for making the place sound so enticing that we couldn’t resist. If you’ve read any of Martin Walker’s books about Inspector Bruno, you’ll know what I mean. Today we went to the real town on which his fictional St. Denis is based and met the bookstore owner who is a good friend of Martin’s. We decided that we would have lunch every day in one of the famous restaurants, not only because lunch is less expensive than dinner but because the portions are smaller and we’ve already had a week in Poland and eleven days on a cruise ship to play havoc with our middles. So we had a duck breast in a tantalizing and not too sweet orange sauce, followed by a light but sinful floating island. Oh, and before it a glass of vin de noix, the local drink made from wine and green walnuts. It was delicious but rather strong for midday. And tonight we stayed home, sitting on our patio with the setting sun shining on us, dining on salad, sliced ham, cooked shrimp and local cheeses, all with a new and crusty baguette and a bottle of local rose wine (which is nothing like the white zinfandel plonk they call rose in America). And I have to confess this seemed more prefect to me than the expensive lunchtime meal. So it made me think about what is true luxury to me, what kind of meal I long for most. And I think I rather like simple things—a picnic with my favorite ingredients in a lovely setting, plenty of time to eat and relax, the perfect temperature, a good wine. Of course when I say simple things I do include lobster, oysters when possible, but will happily make do with good cheeses, fresh bread, ripe tomatoes, fruit. So Reds, which type of meal would you choose? Do you like simple meals al fresco like me or do you yearn for that fancy restaurant with the Michelin star? LUCY BURDETTE: Simple, simple, simple--but please not a bento box:). I love the summer days when the garden is working full steam ahead. 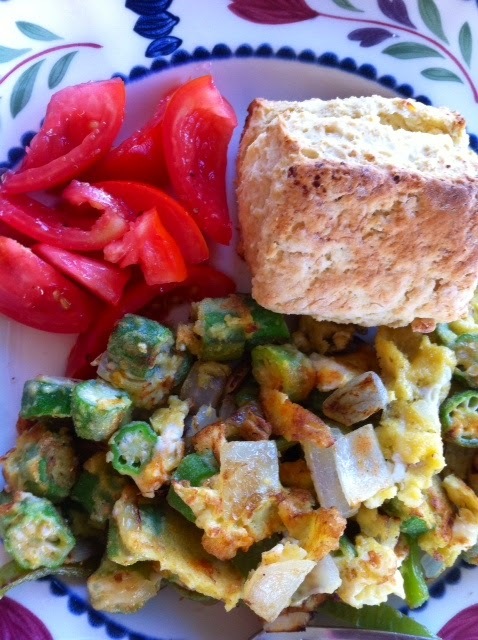 Here's a perfect meal I made for myself last year when John wasn't home (he's more interested in meat)--sliced tomatoes, fried okra, and a homemade cottage oat biscuit. With butter, natch. Though I do love fried chicken and mashed potatoes, spaghetti with meat sauce...I'm going to make dinner too! SUSAN ELIA MACNEAL: SUSAN ELIA MACNEAL: If could choose only one, I'd go with simple. Every once in a while, when the Kiddo and Miss Edna are in bed, the Hubby and I will have picnic night — wine, cheese, crackers, fresh fruit, and this amazing fig spread. Or sliced tomatoes and mozzarella with olive oil and balsamic vinegar. Or ratatouielle and fresh bread. Heaven. We usually stick to vegetarian stuff (I'm one and he's not). If I'm on my own, I like nothing better than toast and jam and tea. Seriously. It's the best. HANK PHILLIPPI RYAN: Well, I could go both ways..and in the middle, too. I'd thrilled with the above-stated picnics..as long as we don't have to sit on the ground. when we were in Italy, we had a picnic (on a table) under the cypress trees--it was prosecco, peaches, pecorino cheese, some kind of lovely crackers, prosciutto and olives. I ASK you! And that night, at a restaurant, we had something which I can't remember what they called, but it was slices of grilled sirloin, with shaved parmesan, and you ordered it by weight. There were also fabulous fresh tomatoes, and the house wine, which was as good as anything I have ever had. I have also eaten in THE MOST expensive restaurants you can imagine, (in Florence and Paris and New York) and I have to say, I, um, never thought it was worth it. A fabulous and memorable events, but...unnecessary. DEBORAH CROMBIE: I do enjoy the occasional fancy meal (my daughter and I did lunch at Gordon Ramsay Claridge's in London a few years ago, and boy, was that an experience!) but the key word is "occasional." Given a choice, simple simple simple. I'm with Susan on good toast, jam, and tea (tea must be loose leaf, made in a POT, however!). There is nothing like vine-ripe tomatoes, some fresh mozzarella and basil and a little good olive oil. Or oysters and champagne. Good simple soups in the winter. Fresh fruit, good cheeses, charcuterie, a fresh baguette and a bottle of wine--absolute heaven! I think we should organize a REDS picnic! RHYS: We Reds are all for the simple life, obviously! Our tastes are so similar, it's no wonder we get along so well! However, instead of toast and jam, could I please substitute a Cornish cream tea with warm scones, clotted cream and jam? How about you, dear readers? Gourmet restaurant or simple picnic (well, not so simple picnic if it includes pate and shrimp and wine). Although I enjoy the occasional "fancy" meal, I'm in the simple camp . . . and I don't mind at all if I'm the one doing the cooking. I agree with Julia that place and food are often an inseparable duo; I'd add that any meal, simple or extravagant, is enjoyable in direct proportion to whoever you have sharing it with you . . . I love, love a gourmet picnic, and think I need to plan one soon. For some years, beginning when my older son went off to college, we had an annual late-summer late-day picnic at the beach with a few good friends. We'd feast on delicious cold grilled chicken, olives, fresh bread, wine, a ripe tomato-cucumber-feta salad, and so on - unfortunately, sans table, Hank! This year (ten years later!) when my older son is home in a few weeks, we're going to resurrect that tradition. Can't wait. Just to play devil's advocate I took the hubby WD-50, which is a molecular gastronomy restaurant on the lower east side in NYC, and it was absolutely magical. Perfect for those Big Deal celebrations. Those chefs are artists. I enjoy eating out, but there is something so wonderful about relaxing at home, especially in the summer, which at our house means grilled delights and vegetables from the garden or farmer's market. Last night made a huge salad with spinach from the garden, luscious first-of-the-season Maine strawberries that we found at a Scarborough farm stand after our Sunday morning beach walk and some crumbled goat cheese. I grilled some marinated cauliflower and a couple of chicken sausages, and used the rest of the quart of strawberries (such a short season, it's okay to gorge) in a galette, mixing in some rhubarb for balance. We ate at Emeril's a few years ago when we went to Orlando (our big splurge) and I must say, it was amazing. Different waiters for every course, the head guy was spot on with the wine recommendations, and I ate this cajun fish dish that was sublime. But in general? Simple. Salad made of whatever came out of the garden that day and maybe some grilled chicken. Plate of crackers, cheese, bread, olive oil. I spent an entire summer eating salads comprised of garden veggies, almonds, Gorgonzola or feta, and a "dressing" of olive oil and balsamic. Okay, I'm hungry and it's not even 9:30. So six of us, including my son-in-law, spent a couple of leisurely hours at table, with exquisitely prepared and presented foods. I have no memory of what we ate, but it was all delicious. Best of all, we were all together, celebrating. But last night we also had grilled steak and asparagus, salad with goodies from the garden, and a blackberry cobbler made with berries from the farm, at our own table, and it was all delicious, as well. Fresh tomato sandwiches are delish, but give me the real mayo, thank you. Oh, I agree,Susan..when you get REALLY GOOD food from an amazing chef, it's a whole new experience. Hank, sounds like you had bistecca alla fiorentina, which you order by the pound. Best prefaced, as is almost anything in Italy, with risotto alla milanese. My preference is for simple, but in recent years I've begun to use up jams and jellies (of which I seem to have way too many) by baking/roasting chicken (or pork, but I don't buy pork) after sprinkling with a little garlic powder, and then just at the end, I melt some jelly (any kind, but my preference is for one with a little bite, like orange marmalade or pepper jelly) in the microwave, add some chopped cilantro, pour it over the meat, and bake for a few more minutes (you can alternatively broil this briefly). You'll want to lick the plate. I like cheese and bread and fruit for a meal, but spaghetti alla carbonara or fettucini with white clam sauce will do me in every time. I do love sashimi, and it doesn't get any simpler than that. What I want is the food I ate at my grandmother's table. She never used, and so never left, recipes. I have been trying to duplicate those dishes for 40 years (which is why I visited an elderly friend about 5 years ago and made her show me how to make Serbian sarma. Which she did, and which I wrote an article about, and when she died a couple of years later, I could still duplicate). I guess I'm just a hopeless foodie. And still wondering what was the creamy green pea and carrot soup served on NW back in the early Sixties, when I got bumped up to First Class because the plane was full. Wonderful, as was the best Chicken Kiev I've ever eaten (it came with a little wooden stick in it that read "Pierce me gently") also on that flight. Or what they called the hardboiled egg halves topped with home-made mayonnaise that I had in Nice in 1963, ordered because it was the cheapest thing on the cafe menu, and it was wonderful. There's a gourmet deli three blocks from my house that sells the makings of my very favorite meal: a crusty loaf of the most amazing bread, a hunk of real cheese, and a good bottle of Côtes du Rhône. This is best shared with my husband on a warm evening in the garden, with a few seasonal extras ranging from radishes and salad greens in the spring to slices of honeycrisp apples in early fall. Bliss. I've enjoyed fine meals wherever I've gone, from the hardest-to-get-into chef's atelier to bona fide shrimp boils. But bread, cheese, and wine is so in the moment. I'm with Hank on this one. I've had some high-$$ meals in my time, but they never quite lived up to the buzz. We were in Paris this Spring & ate dinner at the Jules Verne; not my best meal in the city. One restaurant, though, that never disappoints: Brennan's in New Orleans. Wish I was bellied up for breakfast at Brennan's right this minute. There are cities I would go to JUST to eat. New Orleans (Commanders Palace, Cochon...) Charleston (Magnolia's...) Phoenix (Los Dos Molinos and almost any Mexican restaurant in a strip mall) It's just DIFFERENT from the great kind of simpler cooking I do at home. But molecular gastronomy baffles me. I have ONLY read about it. Susan, what was it like?? Simple works for me as well. The fancy stuff doesn't taste that much better to me, in fact. Gourmet picnics, for sure! We used to call them "hors d'oeuvres-y" dinners when I was growing up. It's still my favorite kind of meal. It only in the last few years that I've grown to appreciate expensive meals in fancy restaurants. I'm pretty down-to-Earth, not wanting to spend money like that. But, now it's a fun splurge. Portland's got a great restaurant scene. bistecca alla fiorentina! Yes, exactly. And SO funny, I had some fabulous grilled swordfish with aioli on a first class airplane, once, a million years ago. (I know, right? scary thought...) Can you imagine? My favorite meals are of the picnic type: bread, cheese, fruit, wine, (and I wouldn't complain if shrimp found its way onto the table)or hummus, labne, and veggies. Add in a great setting like a park or a beach, and I'm in heaven! Rhys, thank you for the introduction to a new author. I'll look for the Martin Walker novels the next time I am at the bookstore. Everyone's idea of the perfect meal sounds lovely. I still have the yummy lemon curd, which I won as a prize (for my hat at your book signing event). It's a treat to have tea and crumpets with lemon curd. Also love the caprese salad (basil, mozzarella and tomatoes) with french sourdough bread during the summer. With local farmer's markets in the SF Bay Area, it's easy to create perfect meals that are also simple. I love going to a really good restaurant once in a while. And while on vacation, eating out at places the locals recommend is one of the best parts of the trip. But I love home cooked comfort food best, and so agree that a BLT with Miracle Whip on white bread is one of the best meals ever. Especially is upgraded with heirloom tomatoes. "Anonymous??" WHO ARE YOU because I'm coming to dinner!! One of the things I most enjoy about traveling is checking out the different kinds of restaurants and foods. A friend of mine, who can well afford to eat anywhere, told me that when she went to Key West with her son and his family, they ate at places like Appleby's or other chain restaurants. I couldn't believe it, with so many great places to eat in Key West, right Roberta? I try to avoid the chains completely when I'm traveling. Well, except for Frisch's Restaurant. Karen will know what this place is. I grew up with the Big Boy sandwich and fries, the platter, and it is to this day one of my favorite meals, probably because I don't live near one anymore. Memories do a lot to make it special. But, if I were to pick out a really great meal, I don't know if I'd choose restaurant food or an at home meal. There is a beet salad at a local restaurant that is simply scrumptious and taught me that I like goat cheese. That would be a great pick on a hot day like today when cooked food just sounds like too much. There was a place at the foothills of the Shenandoah Mountains, a little diner-like place, where my husband and I stopped and had one of the best pieces of cake ever, homemade, of course. For entrees, I tend to favor local restaurants either here or wherever I am that use fresh ingredients and have their own special touches. I was in a sandwich shop recently, and they added red peppers to my turkey wrap, also with avocado, and it was yummy. Like Christopher, I seem to appreciate the meals from my childhood more these days. I, too, have a baked bean dish that was passed down from my mother, but it's one you do from feel, not so much measured ingredients. My meatloaf, mashed potatoes, fresh green beans fixed in the pressure cooker with some bacon grease and a touch of sugar, and sliced tomatoes is always a favorite with me. I still order country ham from the little old grocery in the town in which I grew up. I think the store opened in the 1800s. Hands down the best country ham ever. Hutchison's Grocery in Maysville, KY. They ship anywhere and everywhere. My family doesn't allow holidays without it. I like to take different cheeses to family gatherings or when they gather at my house, too. I find the cheese plate to be a center for conversation and ice breaking. Of course, a little wine helps. I usually have crackers and bread both out with it. Oh, and there is that BLT that is hard to beat. I prefer mine with real mayo, too, but, like Christopher, I grew up eating it with Miracle Whip. This would be a simple lunch if you didn't have to go to France for the cheese— My favorite meals ever were near Rouen. Fresh bread. Local cheeses, especially the Calvados soaked camembert. Wine. Grapes. Fresh press of coffee. Flaky fruity chocogooey creamy dripping pastry. Back home— Lobster-stuffed lobster and a bowl of steamers. Melted butter. Just bring more of that. A good white wine works, if they have it. Don't bother with potatoes and salad or corn. Just forget those extras. Dessert? Fried clams. Rhys, is your first picture from Sarlat ? I went there last year. Visited Périgord when I found out that my ancesters came from there. Ate many good meals too. But for me it´s SIMPLE : fruits and yogourt, salads, soups, good breads are my fave. Reine, that lobster and bowl of steamers sounds like something I had about 25 years ago at Hemenway's in Providence, but I suppose there are other places that do that too? It was fantastic there, but I just went on line and didn't see it on their menu. Still, memorable. Ellen, don't tell my family and friends in Marblehead and Salem, Mass. We almost always go to Gloucester for my lobster stuffed lobster and eat at a restaurant on the pier while we watch the fleet come in. Then we cross the bridge to Essex and have fried clams for dessert. Fried lobster chunks if it's someone's birthday. Yes, Danielle. All the pix are Sarlat. The place we have rented is on the heights above the town. So peaceful.